MANCHESTER, England — A city councilman in the U.K. who is seeking to crack down on street preachers, buskers and those who engage in commerce in the public streets says that preachers are wrong to talk about morality in the open air and to make their hearers feel “insecure” with their preaching. “The Christian Institute has long supported the rights of street preachers and has funded several legal cases where local authorities or the police have unlawfully interfered with those rights,” the organization wrote in a letter to Karney. In the Manchester Evening News, Karney addressed the Christian Institute’s letter, after discussing his primary goal of dealing with vendors without required permits and musicians who play on the street. Karney also said that the city would target street preachers who authorities feel project their voice too much or discuss issues that some members of the public may find offensive. While the Christian Institute has not received a written response to its correspondence, the organization is expressing concern over Karney’s statement to the press. 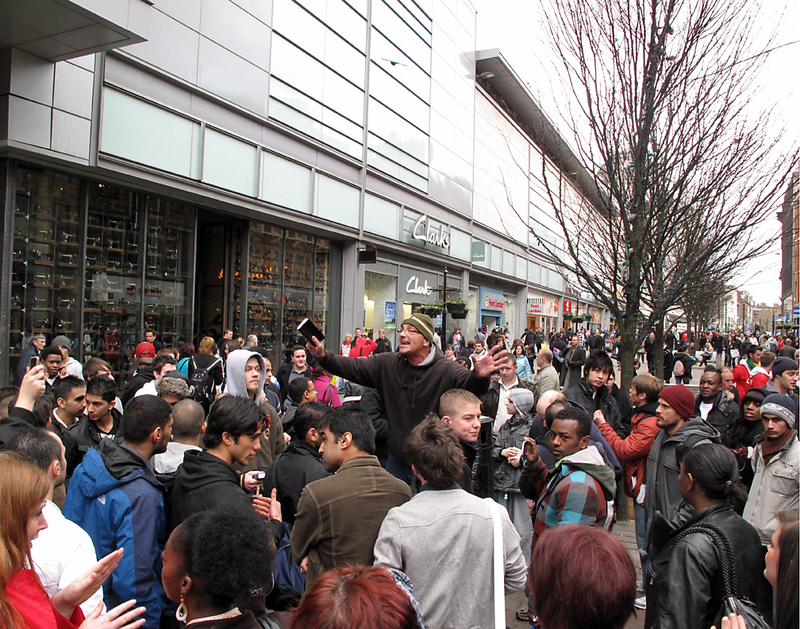 As previously reported, several street preachers have been arrested in the UK in recent years over the content of their speech. English evangelist Rob Hughes was jailed in 2013 after a lesbian accused him of speaking against homosexuality, but was later released and charges were dismissed as he denied speaking on the topic that day. The city later settled with Hughes over the wrongful arrest. American evangelist Tony Miano was also jailed earlier that same year after speaking against sexual immorality on the streets of London. Miano states that he was preaching from 1 Thessalonians 4:1-12 when a woman became agitated by his message and began to spout profanity. He was placed under arrest and marched down to the police station where the was then questioned about his beliefs. Like Hughes, Miano was released and returned to preach on the streets the following day. But UK preacher Mike Overd was declared guilty earlier this year of violating the Public Order Act for citing Levitical law in speaking against homosexuality and for denouncing the Islamic religion on the streets. He was fined 1,400 British pounds, part of which is be given to the man to whom Overd quoted Leviticus 20:13. “It’s [come down to] now going through the Bible, saying that some parts shouldn’t be spoken about and might cause emotional harm,” Libby Towell of the Christian Legal Centre said following the ruling.